In my family, Ultimate Date Oatmeal Squares have a long history. My father-in-law loved these squares and every time we visited, a batch of these squares was always a must-have. My research indicates that this old-fashioned dessert has been popular for a very long time in Canada, particularly in Western Canada, Quebec and Newfoundland. 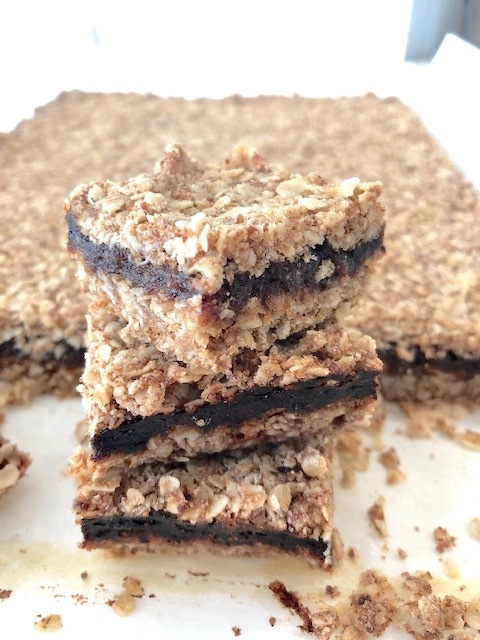 Date squares are made using layers of oat crumb crust and a date purée filling. These delicious squares are also known as matrimonial cake. I thought that this was an unusual name until I understood the significance of the two layers of oat crumble holding the dates together. Apparently, these layers symbolize the couple courting and then completing that bond in marriage (I suppose it made sense back then). 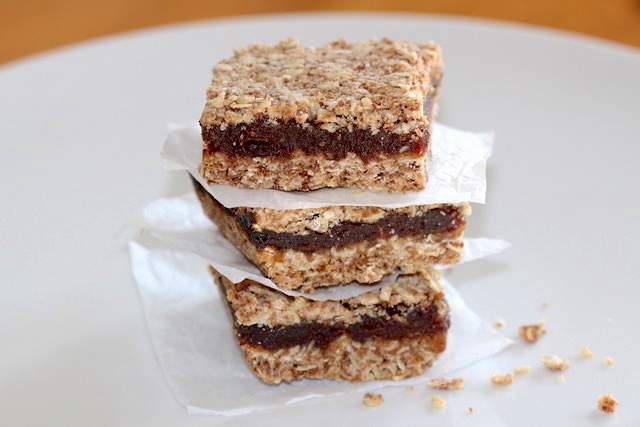 I have made this recipe for The Ultimate Date Oatmeal Squares for many years. I have always used traditional ingredients such as all-purpose flour, brown sugar and unsalted butter, which always provided a delicious result! In this post, I made modifications to this old fashioned recipe and have adapted it to make a gluten-free and dairy-free version with no loss of flavour, texture or overall appearance. I have provided both recipe versions with the gluten-free and dairy-free ingredients listed first and the traditional ingredients following. Both deliver a great result. CHEF TALK: I use quick cooking oatmeal in this recipe because it helps to create a crumb mixture that blends well into the fat (butter or coconut oil). Sometimes using whole oats result in a crumble that does not bind as well and this is not the result you want. In my opinion, this recipe has a perfect balance of crumb mixture to date filling. Grease a 9 x 13-inch baking pan. 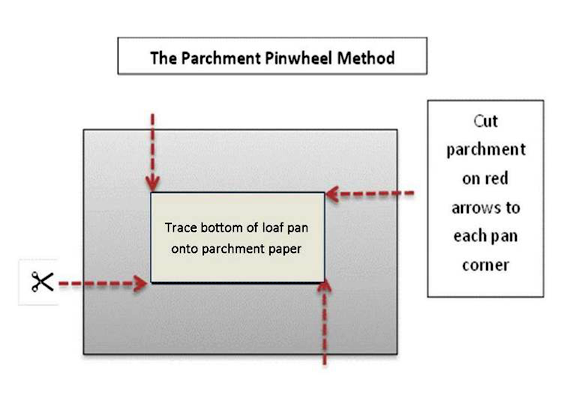 Line it with parchment paper using the Parchment Pinwheel method (see below). For the Date Filling: Simmer dates in water until soft. Add the lemon juice, sugar and vanilla. Cool. For Oatmeal Crumb topping: Mix dry ingredients together, then add butter until crumbly. Pat 2/3 of the crumb mixture into pan. Press this base firmly. Spread with the cooled date mixture. Sprinkle the dates with the remaining crumb mixture on top. Press lightly. Bake @ 350oF. for 30 – 35 minutes, or until the topping is golden. Cool completely. Cut into squares. Store in an airtight container at room temperature for up to three days or freeze for longer storage. WHAT ELSE CAN I DO WITH THIS RECIPE? APRICOT SQUARES: For a variation, use Dried Apricot Paste filling in place of the date filling. Bake, slice and store as per the instructions above. Purpose: For lining baking pans, loaf pans, bread pans, etc. and for easy removal of squares for slicing chilled baked itemssuch as brownies, granola bars, date squares, etc. Method: Set the baking pan or loaf pan on top of a piece of parchment that is approximately 3” larger on all sides than the actual pan (the same as the height of the pan). Take a pencil and trace the bottom of the pan onto the parchment for accurate corner cutting. Then, taking a pair of scissors, cut to the marked corner in alternating directions (top or side) to achieve a pinwheel effect. Press the parchment wheel into the greased loaf pan and arrange it to fit neatly into the corners of the pan. CHEF TIP: In the case of convection ovens, there is an importan point to consider. Convection oven baking is far more effective when using light coloured baking sheets – dark coloured baking sheets often have the problem of over-browning your baked goods. If you own only dark coloured baking sheets – do not despair! Place a sheet of parchment on the baking sheets and you are good to go! 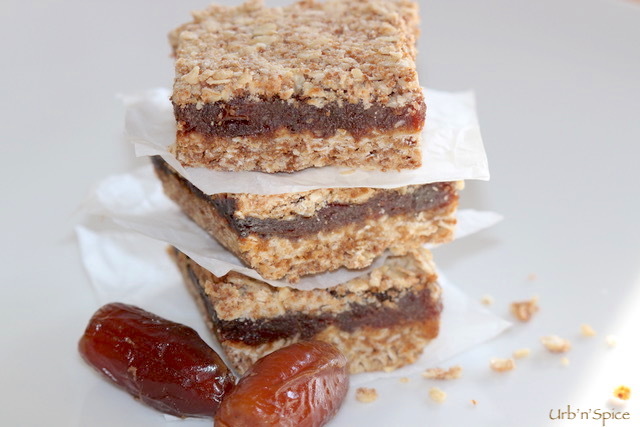 If you try my recipe for The Ultimate Date Squares, please leave me a comment below with your feedback. Don’t forget to pin this recipe for later! A few years ago, I was fortunate enough to be hired as the opening pastry chef of a new Italian restaurant. I say fortunate because I was given the freedom to introduce a dessert menu that would highlight Italian desserts, which are some of my favourites! Traditional Tiramisu, Panna Cotta, Zabaglione and biscotti cookies are always popular choices, however, I wanted to add menu items that were not as well known in Canada. 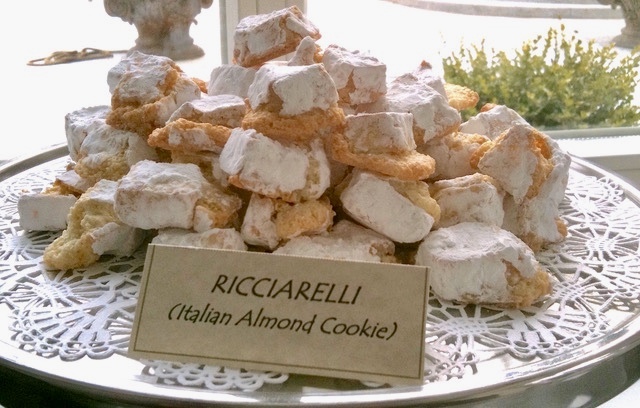 That is why Ricciarelli was considered – An Italian Almond Cookie that soon became a customer favourite on the menu. What appeals to me about Ricciarelli is that it is a rustic cookie with rugged edges and a light, crunchy texture. Another interesting aspect of why I included this cookie on the menu was that I have always adopted a no-waste approach to food preparation. Since there is always an abundance of egg whites left over in the fridge from the tiramisu and other menu items that required only egg yolks, I needed a way to incorporate the egg white surplus into my dessert repertoire; hence, the introduction of Ricciarelli, Italian Almond Macaroons, Amaretti and Twice Baked Meringue Cookie Crisps to the menu. 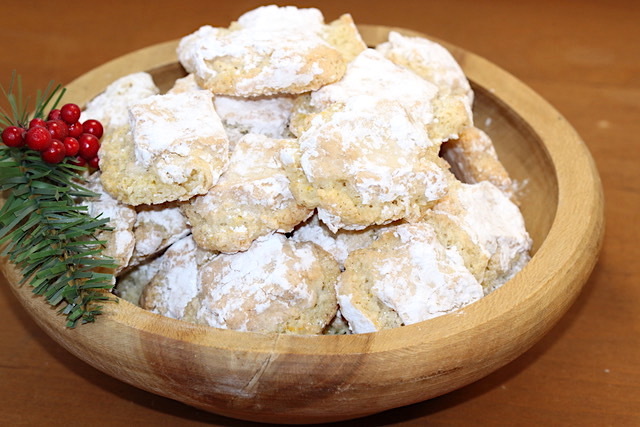 I know that you will love this Ricciarelli recipe as much as my restaurant customers did! Ricciarelli is excellent with espresso or gelato, or just on its own. Have you ever tried a Malteser? It is a confection with a history dating back to the 1930s! American Forrest Mars, Sr. invented the Malteser in England in 1936. They were originally described as energy balls, which were marketed to women as a slimming aid as they had much less chocolate than the chocolates of the day. This classic malt center candy is a tiny light-as-air sphere covered in milk chocolate. While I am not a huge candy consumer, I find these particular bonbons quite unique both in texture and in taste. I have created a cheesecake that incorporates Maltesers, along with white chocolate in the filling. 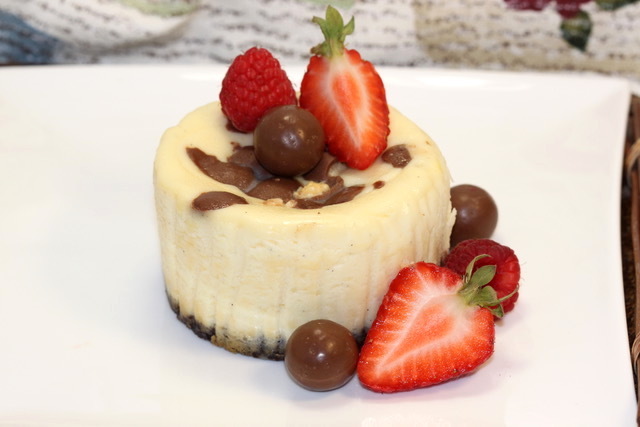 Malteser White Chocolate Mini Cheesecakes are an individually baked cheesecake that maintains the crunch of the Maltesers candy as well as highlights the chunks of candy. Try it! You will enjoy it! It is interesting to note that Maltesers are one of Canada’s top 10 selling candies, along with popular brands such as Crispy Crunch, Aero Bars, Glosettes and Smarties. Cherries are in season in the Okanagan and there are so many ways to enjoy them. I could only eat so many raw cherries, and I needed to expand my repertoire of ways how to use these beautiful cherries. With that in mind, I have been playing with recipes for cherry compote, cherry cordial, cherry Danish and the featured recipe, Dark Cherry Vanilla Dairy-Free Ice (Nice) Cream. There are members of my family who are dairy intolerant; so I developed my own version of a dairy-free dark cherry ice cream. One option is to use coconut milk for a dairy free alternative because it provides the same texture and creamy mouthfeel that an ice cream base made with cream would provide. Full Fat Coconut milk is quite expensive when compared to the cream that is used in regular ice cream. Therefore, for a number of reasons, I have used bananas to supplement the base mixture. Bananas add flavour and a natural sweetness to the base and are a more economical way to make dairy-free ice cream rather than using only coconut milk. It is interesting to note that when bananas are utilized as a major ingredient in dairy-free ice cream, it is called “Nice Cream.” The term ‘Nice Cream’ has become a common culinary term. “Nice Cream” is defined by the process of puréeing or blending chunks of frozen bananas into a soft style ice cream. While I enjoy the smoothness of this frozen dessert, it does not hold up well when you serve it. The addition of coconut milk creates a much more stable velvety texture with a delicious creamy flavour. 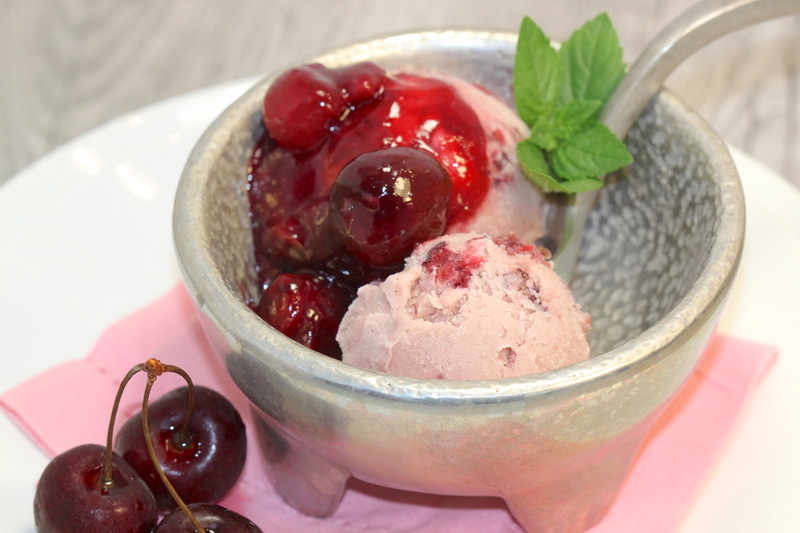 When chopped dark cherries are added, this dairy-free frozen treat is taken to a new level. I have included almond extract in the ingredients because it pairs so well with cherries (omit for nut allergies). 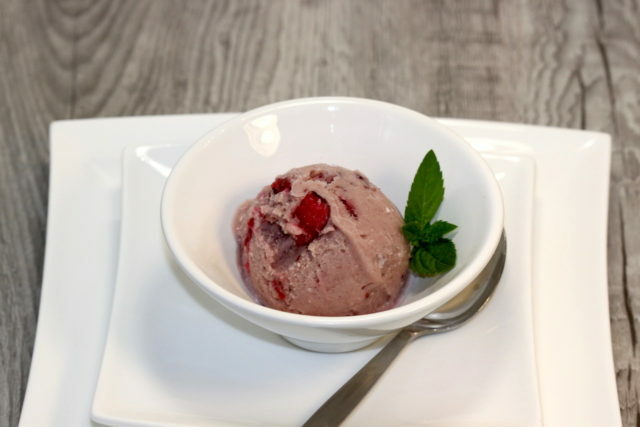 There is one ingredient that you might not expect in this dairy-free ice cream and that is gelatine powder. Gelatine helps with the texture of this dairy-free ice cream, which can often be as hard as a puck due to the lack of fat and sugar. CHEF’S NOTE: Granulated sugar is often used in ice cream recipes because it does not freeze and keeps the ice cream from over crystalizing. You can use any type of sugar (granulated, liquid sugar such as maple syrup, honey, etc.). Sugar unquestionably gives the ice cream a more familiar texture. As Julia Child said, “Everything in moderation – including moderation.” It is really all about balance in everything that you eat. As frozen desserts go, a small portion of this ice cream treat is a healthier and enjoyable dairy-free option. Dark Cherry Vanilla Dairy-Free Ice (Nice) Cream is also gluten-free, egg-free, refined sugar-free and nut-free (if you omit the almond extract). Typically, I will have lots of cherries left over, so I also want to share with you a recipe on how to make a delicious Dark Cherry & Vanilla Compote that is ready in less than five minutes. Dollop a spoonful of this compote on top of a serving of Dark Cherry Vanilla Dairy-Free Ice (Nice) Cream and you will have your guests and family coming back for seconds as this delicious compote goes so well with the Nice Cream…. Watermelon is one of the summer’s greatest pleasures. For my family, enjoying watermelon while sitting outside around our picnic table or on the back porch was a real pleasure. We would grab thick wedges of melon with the rind on, which made it much easier to hold onto. We would devour the bright pink fruit until we could not eat another piece, watermelon juices dribbled down our chins, which made the smiles on our faces sticky and pink and most satisfied. When I was a child, my father grew ‘Sweet Beauty’ melons in his large garden. We would always have our eye on the biggest melon in the garden and we watched it grow daily from an egg-sized oval to a monster melon. When the melon was perfectly ripe, the neighbourhood children were invited over to share the summer delicacy. It was so heavy that Dad would carry it to our rustic old table using a wheelbarrow. What a feast we had! Whenever I see watermelons today, my mind races through all those wonderful childhood memories of friends and family. Over my career, I have made watermelon granita; watermelon and lime sorbet, and many litres of melon infused water and other similar treats. Watermelon is quite tricky to use in desserts because of the high water content. The flavour and colour can easily be compromised if overheated. So, when I read about an intriguing dessert called Watermelon Gelée by Chef Eddy Van Damme, I wanted to experiment with it! Watermelon Gelée is a gelatine set dessert using the juice of a watermelon. The vivid pink hue is further enhanced by the addition of raspberry liqueur. A very interesting option to consider as a garnish for the dessert is the use of tapioca pearls tinted with raspberry puree. 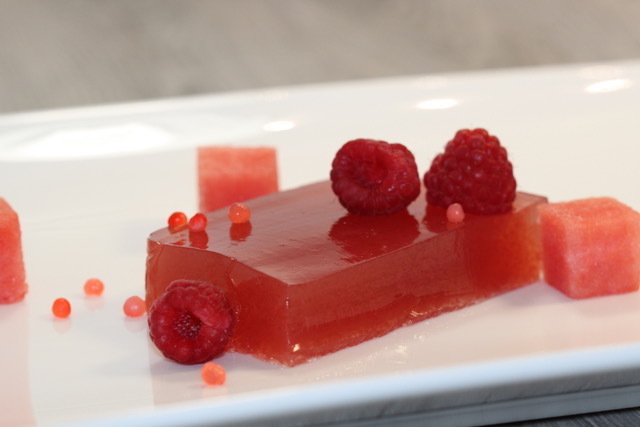 Watermelon Gelée is refreshingly fun to make and gives you a flavourful alternative when serving watermelon this summer. You need to try this! You will enjoy it. Planning a menu for a pure white dessert can be a challenge. Having said that, I created a Greek Yogurt Lemon and Vanilla Bean Panna Cotta for Canada Day. Panna Cotta is a natural choice for its purity of white colour and its simplicity to make. I love the fresh look of panna cotta, a gelatine set custard made from dairy products which often include cream and/or milk. In this recipe, Greek yogurt is used because of its tangy taste. Creating a pure white dessert requires eliminating vanilla bean paste because it would tint the custard to an ivory colour. To solve this problem, I added just a smidgeon of vanilla bean powder, which will show only the tiny specks of the vanilla bean seeds in the dessert while retaining the purity of the white colour. As well, I used lemon in two ways (juice and zest) as a flavouring ingredient, which compliments the tangy Greek yogurt. Have you ever noticed that most restaurants offer cheesecake on their dessert menu? It is definitely a favourite choice for many people and also for the restaurants as cheesecake stores and freezes well. I prefer making cheesecake in individualized portions, served simply with a raspberry coulis or a few fresh berries. In this post, I will share a recipe for Raspberry Mini Cheesecakes. This featured cheesecake recipe has a pink hue created by the raspberry puree which is combined with a delicious coconut crust infused with lime zest. 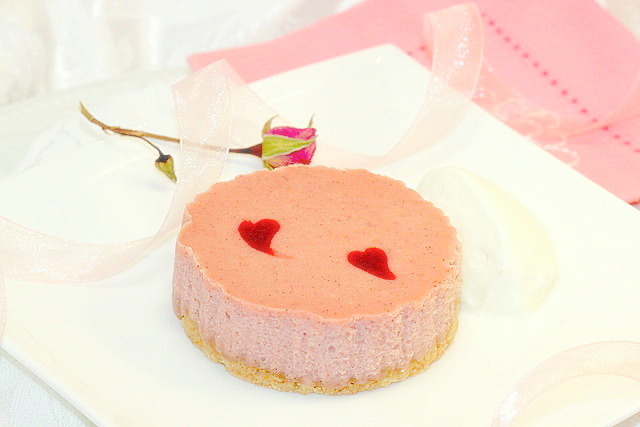 For Valentine’s Day, I dress the cheesecakes up by creating a heart swirl decoration before it is baked. The decoration stays attractively suspended on top of the thick cheesecake batter. Do you have a fear of making pastry crusts? In this post, I want to teach you how easy it is to make a press-in chocolate crust (no rolling pin required), as well as a simple-to-make chocolate ganache filling that is poured into the crust and then baked. 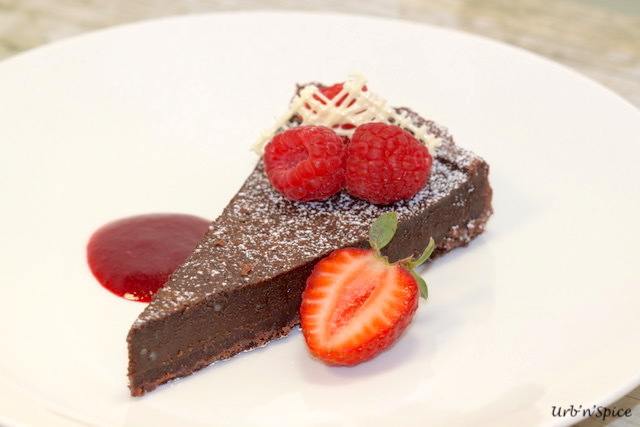 This Easy Decadent Dark Chocolate Tart is rich and delicious and perfect when served with a light dusting of icing sugar or a dollop of softly whipped cream. For a special event, such as Valentine’s Day, a few fresh berries and a chocolate garnish will make this dessert a real hit. It is also lovely when served with Raspberry Coulis. Aquafaba is a unique bonus ingredient that not too many people know about. I call it a bonus ingredient because it is something that most people discard like the heel from a head of celery or the skin of a cooking onion (both of which I keep and freeze and use in making soup stock). Aquafaba is the liquid from a can of chickpeas, or beans or peas. It is used as an egg substitute, and can be added to baking; for example: made into meringues. Aquafaba can be whipped exactly like egg whites and can be used to make products where a meringue is called for such as amaretti cookies or lemon meringue pie. 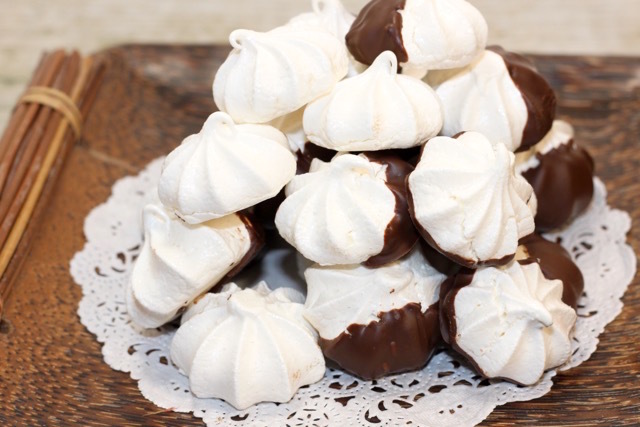 In this post, I will teach you How to Make Aquafaba Meringues. People react in disbelief when I explain to them the meringues are made from a liquid from a can of chickpeas. After a taste test, they admit that they are really good and they cannot tell the difference between the aquafaba and an egg white meringue. I always try to build my recipe/product repertoire for dietary restrictions, and aquafaba has been on my ‘to try list’ as an egg-free option. I found the aquafaba meringues somewhat more tender but as indicated, there is little difference in taste from meringues made from egg whites…. Making Ice Cream, Sorbets, Sherbets and other frozen desserts was a huge part of my job as a pastry chef at a busy golf and country club. I thoroughly enjoyed the process of making ice cream and thought I should start sharing some of the wonderful varieties of ice cream that I had the opportunity to create. One of my favourites was a Zesty Lime Ice Cream. It is quite refreshing and one of the quicker ice cream custards to make. The sour cream adds a tanginess that balances the custard well. 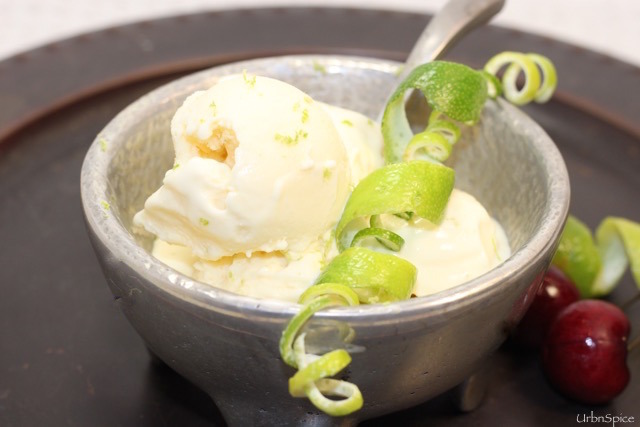 The little flecks of lime zest throughout the ice cream make it a very attractive dessert. It was usually served very simply with a garnish of berries, a crunchy cookie in a stemmed ice cream goblet.